Need to view a WDB file on your Mac? There's an app for that! LawBox's WDB Viewer allows you to open, send, and convert your Microsoft Works WDB database documents. And it's backed up up by our famous customer support, so you know help is never more than a a couple of lickety splits away. Need to view a Microsoft Works WDB document on your Mac? There's an app for that! Need to view a Microsoft Works WDB file on your Mac? There's an app for that! Open, view, send and convert MSWorks WDB database documents with an application crafted by the document conversion specialists at LawBox. WDB Viewer Pro can read WDB, CSV, and XLS documents; and can save as CSV, XLS, PDF, and HTML. 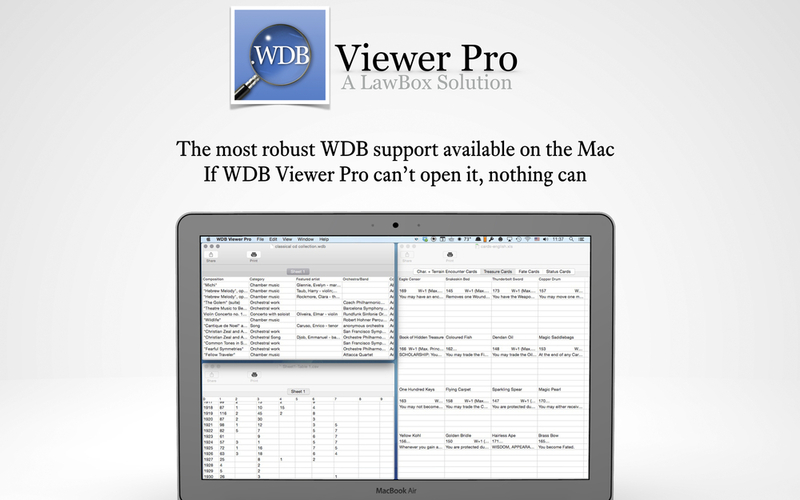 WDB Viewer Pro requires Mac OS-X 10.7 or above. WDB Viewer Pro can open WDB documents, Microsoft Excel XPS documents, and comma-seperated value CSV documents; it can export documents as PDF, CSV, XLS, or HTML – everything you need to share your content. Can I Create WDB Documents With WDB Viewer Pro? No. WDB Viewer is not an editor: it is designed to help you view your WDB documents and convert them to a format that other mac applications can read and edit.